Anchor point position relative to the sign can be selected from ENUM_ARROW_ANCHOR enumeration. Large signs (more than 5) can only be created by setting the appropriate OBJPROP_WIDTH property value when writing a code in MetaEditor. 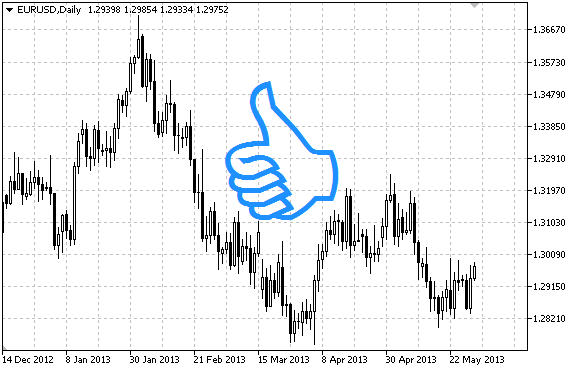 The following script creates and moves Thumbs Up sign on the chart. Special functions have been developed to create and change graphical object's properties. You can use these functions "as is" in your own applications. #property description "Script draws \"Thumbs Up\" sign." #property description "Anchor point coordinate is set in percentage of"